Toasted Sliced Bread With Butter Kaya,Two Half Boiled Eggs & Hot Coffee O or Hot Tea. 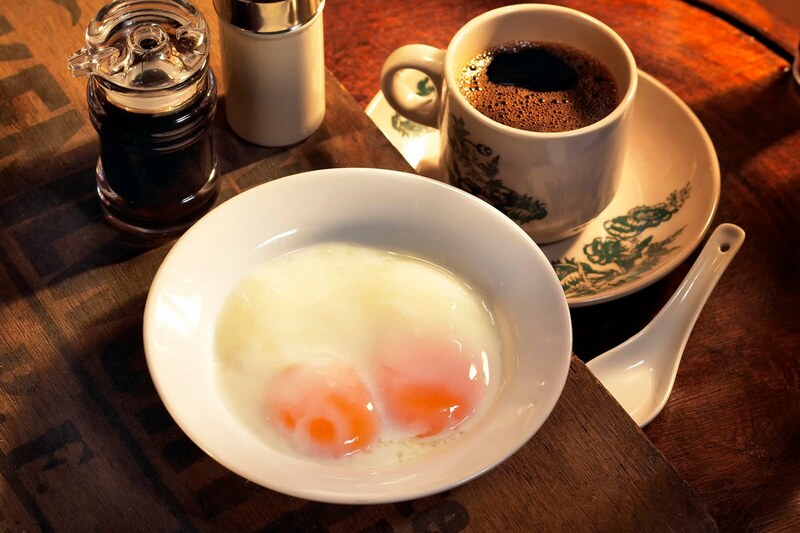 One Toasted Bun With Butter Kaya,Two Half Boiled Eggs & Hot Coffee O or Hot Tea. Applying modern business techniques and strategies, the cafe's interior is tastefully done to reflect a traditional kopitiam but with the added comfort of air-conditioning, modern table setting and neat decor creating a warm, welcoming ambience. Until today, the cooking style, unique flavours and distinct tastes that the Foh Heong Kopitiam is noted for has undergone very little change. Food has been our passion and love, so we try to keep the recipes as original as possible. There's no fusion or the so-called experimental food. Patrons will be familiar with such authentic items like our specially prepared coffee/tea, home-made kaya with toasted bread (rotibakar) and half-boiled eggs, popular hainanese chicken chop and fish fillet prepared as in colonial times, mee soup, mee goreng and of course, the all-time favourite, hainanese chicken rice. All our dishes are halal certified.